The pig has multiple uses in our daily life – not just as meat but also in other industries. At work, at the hospital or at school. A pig is mostly known for his meat, but then you still have the bones, skin, hair, belly fat, blood and organs left over. These components are processed in many other products. Drop and winegums are made from gelatin, from the skin. Shampoo and anti wrinkle cream contains fat from a pig. And your bread stays extra soft by the hair protein. But also x-rays, brake discs and matches are made of parts from the pig. Westfort meat products is a family business that has specialised in pork processing for many generations. We purchase our pigs directly from the farmers, often also solid family businesses, always from the Netherlands. We are proud of the cooperative relationship we have developed with our farmers over the past few years. It is, in part, thanks to these farmers that we are able to offer our clients distinctive, superior-quality pork. We will continue to develop this relationship together with the farmers, and see many opportunities for the coming years. Pork is a product to be proud of. It is our mission to surprise clients, consumers and the market with the best possible products, with a flavour that is second to none. This creates opportunities in the retail industry, but also on the farms. 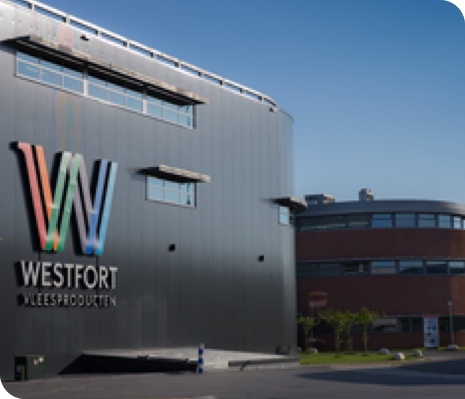 Our products are exported all over the world, from Africa to Asia, America and Australia.Westfort provides a variety of unique pork concepts: concepts centred around the requirements of the client and consumer, and concepts that enable us to guarantee you a product with a distinct identity. We supply meat with a story – the story of a sustainable chain designed for a better environment and better animal welfare, or a story of organic meat produced with passion and authenticity by a pioneer. The IJsselland cold meats line consists of sustainable, artisan cold pork products with the Sustainable Pork Value Chain label. The cold meats are produced using authentic methods, without artificial colourings or flavourings, and with as few E numbers as possible. KDV (Sustainable Pork Value Chain) produces delicious pork that's made with respect for the animal and the environment. Over 300 farmers are already working in accordance with our method. The meat is on sale at more than 500 retail outlets. KDV+ is Pork with the Better Life a star rating of the Animal protection (Dierenbescherming). Pigs growing up with more attention for animal welfare and the environment. They have additional living space, daily portion of Lucerne roughage, adequate daylight and good ventilation. Sustainable Pork Value Chain Association (Keten Duurzaam Varkensvlees) is a cooperative venture between Dutch pig farmers, slaughterhouses, wholesalers, butchers, cold meat producers, retailers and caterers. Our association doesn't just set standards for our partners – we also help them meet our strict standards on animal welfare and the environment. Together with the farmers, we bring innovations into their farms that they would not have been able to implement on their own. We examine where there's room for improvement, test innovations, and work together achieving energy-neutral pig farming, and putting healthy and tasty meat on your plate. We don't do all this for profit – we do it because we believe in it.